If you have children, chances are you have at some point given thought to the possibility that they will, one day, go to college. At the same time, one of the biggest financial concerns is the cost of college altogether. While not all children may go to college, chances are that at least one of your children will – and although the cost of their college education might just be one that they can pick up on loans, if you are thinking forward, chances are you might want to help set them off on the right foot – without having to rely on loans. It’s better to save now than to try to save later. It’s better to help them start off on the right foot with some advance planning than to see them struggle with debt and loans at a relatively early age. It’s cheaper to save now than to loan money later – right? With those thoughts in mind, being proactive as a parent to help them save for college is possible – getting started is relatively easy, with these 5 questions in mind. 1. To Save or Not to Save? Will your children go to college? 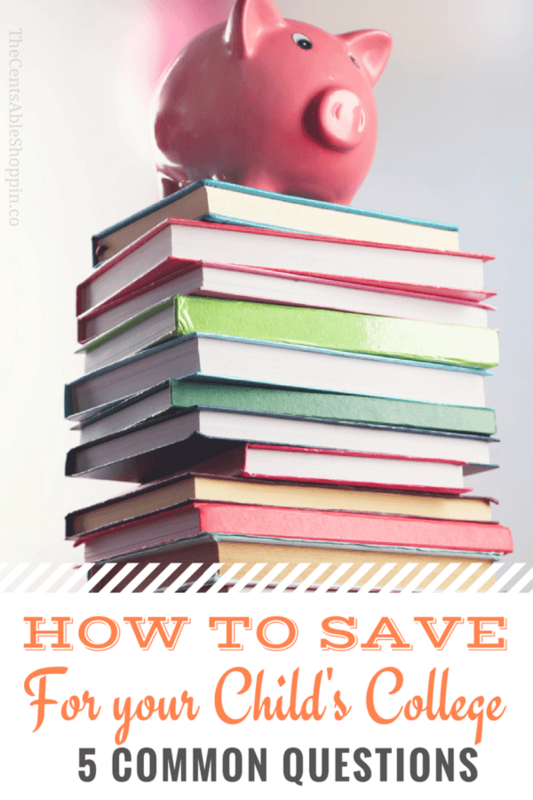 That we don’t know – but considering it’s cheaper to save NOW than loan money later, then saving should be your goal whether or not we know their future plans. Considering most children don’t have a plan for college and rely on financial aid (also known as student loans), I have always taken the direction of starting them off in a way that helps them stay out of debt, not get into debt. Then at least your children will have the option for college IF they decide. At best, they will have a college fund and due to diligence and early planning. 2. How much of my child’s education should I pay? What you are willing to pay for your child’s education is completely up to you – just like buying a house, many people can’t save up 100% of the cost of the house. Saving for college is comparable. If you don’t want your child to take on debt, it’s wise to save at least half of their college education cost. Remember that it’s cheaper to save than to borrow – because if you borrow, every dollar will cost you double by the time you pay off the debt. If you save, you are not only eliminating the need for loans but you are earning interest rather than paying interest. Time is probably your best asset – and it’s best if you can start as early as possible – from birth. Saving as early as possible will give you the benefit of compound interest over time – and it does add up quite fast. If you start at the time they are born, 1/3 – 1/2 of their college fund will come from your earnings. But if you wait until they are in high school, only a fraction will come from earnings and you will have to save more than 5 times each month – you have now lost the benefit of compound interest over time and years on your side. The best vehicle for saving for your child’s college is a 529 plan – contributions will be taxed by the earnings are not taxed. You can set up a 529 plan when your child is born .. but you will need their Social Security Number. Your institution may allow you to set up the account without the SSN, by designating yourself after the beneficiary, then allowing you to change the beneficiary to your child once the SSN comes in. 4. How do I save the money? Set up a continuous investment on a monthly basis from your checking account, where your investment pulls a specific amount from your account and deposits it automatically. When you score a raise at work, or a windfall amount from a refund, or even if you earn an inheritance, take a portion (half perhaps) and divide it amongst your children. If you are paying regular daycare expenses, and your little one starts school, take what you were paying for daycare and redirect that money to their college fund. The same goes with diapers – if they move up and out of diapers, deposit that amount that you were paying into their college fund too. Not only will you be fattening up their fund, you will be doing through a redirect of your cash flow. And when you set up the account, your institution may ask you if you wish to make the investment choices on your own or use their age based allocation – the age based allocation starts out risky (aggressive) when they are young since they have more time to recover, and then slowly moves more conservative as they grow older and approaches college. 5. Do I Save for College or Save for my Own Retirement? You should always save for your own retirement first; likewise, you should never start a college savings until you have paid off credit card debt and established an emergency savings. A 401K or Roth IRA are great ways to start saving for your retirement – then when you start earning a little extra, consider starting your child’s fund. If you are able to save for your children alongside your own retirement then even better. Now that I’ve Saved, how to I Lower the Cost? College is far from cheap – the average cost for 1 year of college right now is just under $9,000. If your children have plans to attend at a school out of state, or a larger university that number may essentially be more. When your high school student talks about college, it will likely involve money – and chances are, most students will borrow to attend, racking up (in some cases) up to $50,000 if not more in student loan debt. A recent study by Sallie Mae shows that 36% of middle income families and 29% of low income families are actually PUTTING away for their kids college fund. That is a scary figure – many rely on student loans to fund their college cost, and student loans can mount up to be one of the biggest payments for students after college and for year after they are done. Encourage your children to start at a community college and then transfer to a state university. Check out vocational programs, which offer more of a specific career path without the added fluff of a 4-year degree. Support your child’s wishes to take a gap year after high school to allow them to determine their interests before they go off to college without a plan. Encourage your children to work while in school through a part time job. And look into housing options, or establish an agreement with your children that they can live at home if they maintain a job and attend classes consistently. A healthy, established savings fund may in fact make it possible for your child to attend college after they graduate – and while it requires your diligence and sacrifice, it is possible. Time and consistency are two of the biggest collaborators that can help you make it happen.